Sustaining a serious injury while you’re out grocery shopping or running errands might seem pretty unlikely, but accidents like these are more common than you might realize. 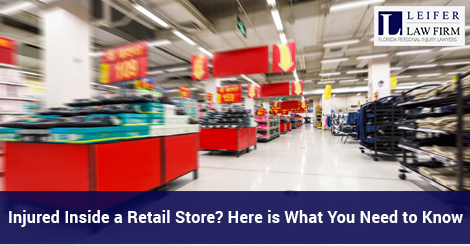 Retail properties can have numerous hazards that can cause individuals in retail stores to fall, to be victimized by criminals or to be hit by falling objects. All of these can carry serious repercussions for the victim who may need weeks or months to recover from a serious injury—and why they need a team of premises liability attorneys Boca Raton. Read more about premises liability cases here. Many individuals who have sustained slip and fall injuries in retail stores are shocked to realize just how much the accident will impact them for many years to come. It is important to remember that after getting medical attention for your injuries, you may wish to consult with a premises liability lawyer Boca Raton. You may have grounds against an individual or other entity as a result of your injuries. The injuries sustained in an accident like this might seem minor at first, but can easily evolve into ongoing pain and even long term complications. If you slip and hit your head, for example, you could be dealing with a major head injury that makes it impossible for you to return to work. If the burden of responsibility falls on another individual, like they failed to remove a hazard from his/her property, you may be able to hold them responsible for your injury. How Does Premises Liability Representation Work? Premises liability representation is available to those who have sustained injuries in a situation where the property owner or manager should have known about the hazard or fail to warn you properly about it. The most important thing you can do for your future is to schedule a legal consultation with an experienced premises liability attorney Boca Raton. It’s important to know that the compensation received from a case like this could be crucial for allowing you to fully recover from your injuries and move on with your life. What You Need to Know About Who May Be Liable in a Premises Injury Claim? An injury or a wrongful death can be caused by numerous different factors such as failure to warn about the problem, negligent maintenance, inadequate security or poor lighting. Numerous injuries may be associated with a slip and fall accident depending on the circumstances of the case. All of these injuries can have a significant impact on your life making it difficult or impossible for you to return to work. Thankfully, Florida personal injury law allows you to file a premises liability claim against a negligent party. Speak to your premises liability attorney in Boca Raton to learn more about the evidence you need to collect in order to file a claim like this. There is no doubt that your life has changed significantly in the wake of a retail store accident but consulting with an attorney is the only way to protect your rights and move on effectively.